We offer a full range of glazing supplies at our showroom which you can find by clicking the link to the right. Copper Foil 3/8", 7/32", 1/4"
Tatra Glass (UK) distributes stained glass throughout the UK. We also send stained glass to customers across Europe. For information regarding the cost of your order please get in touch with us for a quote. 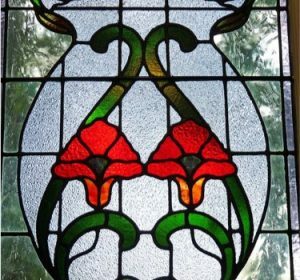 Want to learn more about the origins of stained glass making? 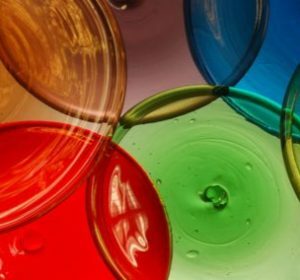 Click below to learn the history of stained glass manufacturing processes. The origin of glassmaking is unknown, although earliest evidence discovered by archaeologists suggests Syria as the seat of origin. Glassmaking specifically for use in windows was widely used by the Romans who were casting glass onto a plate. 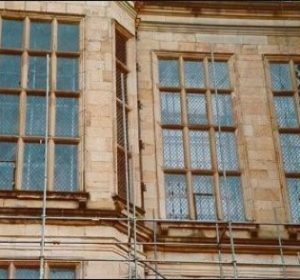 Specialisation in window glass developed in the Seine and Rhine areas of France and Germany, due to reasons of climate and increase of window space in the buildings of medieval society. Two methods were used – the cylinder method and the crown method. Eventually, other methods were discovered such as cast glass, rolled glass and sheet glass. These labour intensive methods gradually disappeared as machinery took over the role of humans, and we are left with the float process, producing perfect glass. The only traditional method of flat glassmaking left is the cylinder process, also known as broad or sheet glass. 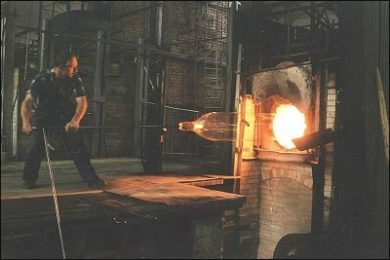 Basically, the glass is gathered on the end of the pipe and placed on a block of wood hollowed out to the diameter required and is then blown to the required dimensions. 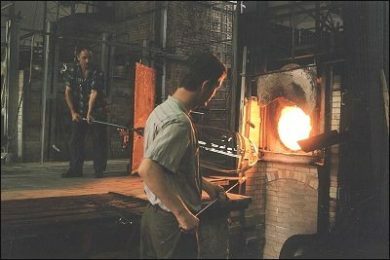 The glass is then re-heated. When ready, the blower swings the pipe in a vertical plane and inflates the glass until it is elongated into a cylinder of the required size. 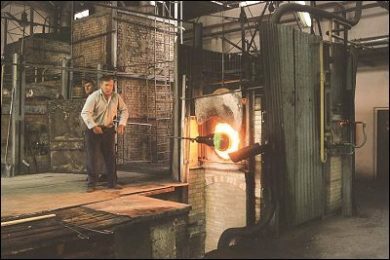 Next, a lump of molten glass is attached, and the cylinder is blown until the heated part yields it open. The cylinder is then re-heated and opened out by rotation. It is next laid on a wooden horse and detached from the pipe by the application of cold iron. It is then split down the length by cutting or the use of a hot iron. The split cylinder is then passed into the flattening chamber re-heated and flattened on a smooth stone with the use of a “polissoir” or block of wood on the end of a rod. It is then passed into the annealing chamber. 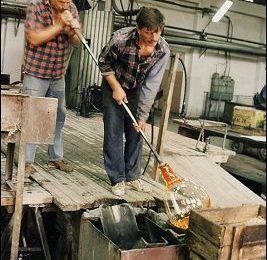 This method of making glass may vary slightly from country to country. At present, there are three factories left in Europe – Jaslo in Poland, Lamberts in Germany and St Just in France. 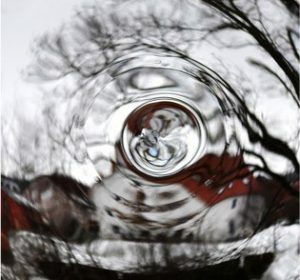 There is also Blenko in the USA making a small amount of cylinder glass. 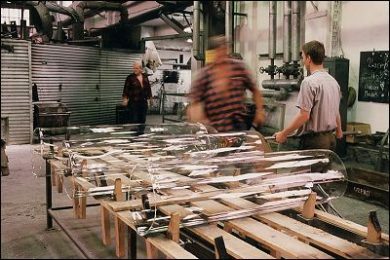 This process has survived because there is still a demand for this type of glass. The colour range is limitless; the glass is used ecclesiastically, commercially, domestically and for restoration purposes. It is also easier to make in comparison to any of the other processes.